NBA Finals Recap ~ Roundball Manor - The House that Basketball Built. The Heat trotted out an already-small lineup with Chris Bosh at center. His ability to stretch the floor on offense was a viable weapon, but he is not a great shot blocker or rebounder at the power forward position, let alone as a center. This gave Tiago Splitter and Tim Duncan an immediate advantage. The achilles heel of this Miami Heat team came in the form of Rashard Lewis. For a guy who spent most of the season on the bench, Erik Spoelstra became ENAMORED with him after his offense outburst against Indiana in the East Finals. Thinking he could repeat that performance on a nightly basis, Spo tossed in Lewis at the power forward spot, creating a viable stretch 4 on offense but leaving them bleeding out in the paint and their interior defense. This was their ultimate doom. The Spurs were able to move the ball with pinpoint precision, work it into the paint and then around the floor with ease. Once the Spurs figured it out during Game 3 in Miami, the series was over. There was no answer. It was too late to work in Udonis Haslem at the end of Game 4, a move that was deemed insulting here at The Manor. If the Heat were to have any chance in that series, Udonis Haslem was to have played starters minutes the entire series. He is the only real rim protector in that lineup, something that Mr. Pat Riley MUST address in the off-season if they are to compete and win another title. It may not have made a difference in the final outcome, but it would have given the Heat defense the shot in the arm it needed to compete. Lets not let the Heat perimeter defense off the hook either. Hello Mario Chalmers, you can wake up now. You can also say goodbye to any lucrative free-agent contract you could have received after a stellar finals performance. Dwayne Wade was also caught sleeping through important stretches late in games. His tenacity to stop the dribble penetrator and create fast break opportunities was sorely lacking. Ray Allen was rendered ineffective in this series due to his long minutes and poor substitutions by Spoelstra. Jesus Shuttlesworth is most effective in short spurts for a offensive pop, he is no longer effective for extended periods and becomes defensive liability, only creating more havoc for the Heat on D. These defensive lapses created a chain effect that highlighted the Heat's deficiencies. Do not mistake this as a Heat bashing session, but the glaring gaps on defense were a result of poor lineup management by Coach Spoelstra. This wasn't even a chess match between coaches, this was Pop playing checkers and using one swift nine-jump-attack to clear the board. Much of the success for the Spurs can be attributed to their bench production. Boris Diaw, aka the French Churro, aka the Doughy Distributor, became a match-up headache when he lined up at power forward. It drew LeBron out of the paint and left it wide open for stellar reserve Patty Mills to run around on a wire, catching crisp passes from Diaw and either getting to the paint or dropping threes at will. Diaw may have started game 5, but his contributions to this series were paramount. And lets not forget Señor Manu GINOBIILLIIIIIIII with his cold blooded, turn back the clock, epic game 4 and 5 performances. The bench for San Antonio out-played and out-worked their opponent on both sides of the ball. If Miami wants to win another championship, a big man and a bench are on their short list of needs. For a series that was expected to go the distance, not many people could have predicted that the Spurs would destroy Miami on their home courts in games 3 and 4, taking a commanding lead with them back home for a definitive game 5. 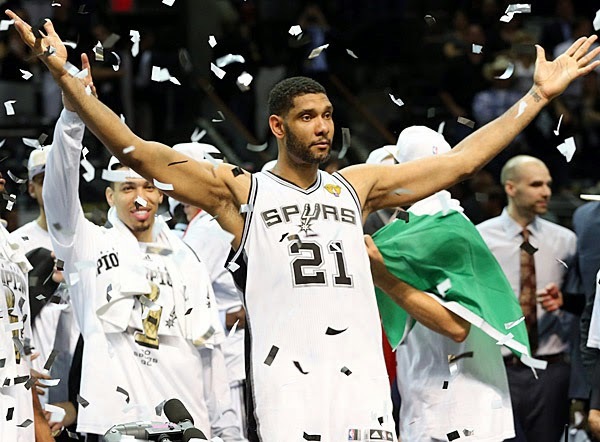 Not many people predicted a 37 year old Tim Duncan would lead the Spurs to their fifth championship in 15 years. Not many people thought this group of wily veterans would continue to defy all odds and push the limits of their capabilities, redefining the term dynasty and the history of this great game. But that is exactly what they did. Oh and they'll be back at it again next year, so beware.